Only one more month to go! The 2010 World Cup tourney kicks off in South Africa ONE MONTH from today! Yes, the most watched sporting event on the planet -- sorry, Super Bowl & Olympics -- will soon be in full swing. Don't be surprised if between June 11 - July 11 if many of your co-workers suddenly vanish from the office. Better start to create your excuses for missing work now, peeps. The more creative, the better. As for me, I work for myself and my boss is a huge football fan so I've got nothing to worry about on that score. 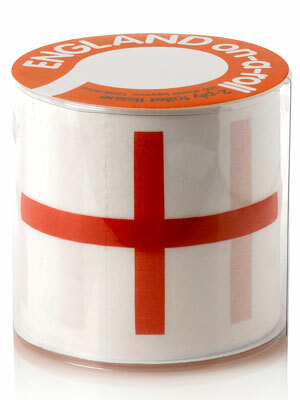 I'll be camped out at the nearby pub with my Rooney kit and Brit hubby in tow cheering unabashedly for England. 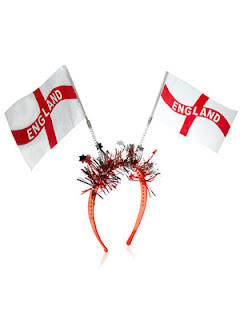 I would also LOVE to have any of these funny accessories available now from Accessorize in the UK. Head bopper complete with sparkles, or England toilet paper, anyone?